THE EVILEST OF THEM ALL talks about all things villains. It goes through the popular ones like, Jafar, Ursula, Maleficent, and more! It talks about the likes, dislikes, strengths, weaknesses, and fun information of each one. There's also some interactive flaps that open up. I love the layout of the book and the pictures. 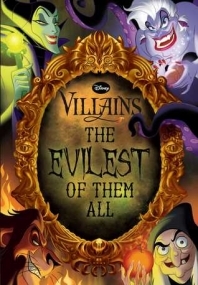 This is the perfect addition to any Disney collector's library, especially those who like the villains. I loved seeing the newer ones like Mother Gothel and Dr. Facilier. I love the humor and how vibrant the pictures are. This is a fun read fans won't want to miss. Final Verdict: I would recommend this to fans of Disney, villains, and humor.